Duration: The Ghost Walk takes place in the evening and lasts approximately 90 minutes. Cost: €15,- per person. Payment in advance through our online booking system. Click on Book now. When you want to book as a private group (minimum 10 persons) please contact us by mail or telephone to settle on a date and time. Private groups will pay in advance by invoice. Meeting point: In front of the Irish Pub The Tara at Rokin 85-89. Please be there 5 minutes in advance of departure time. 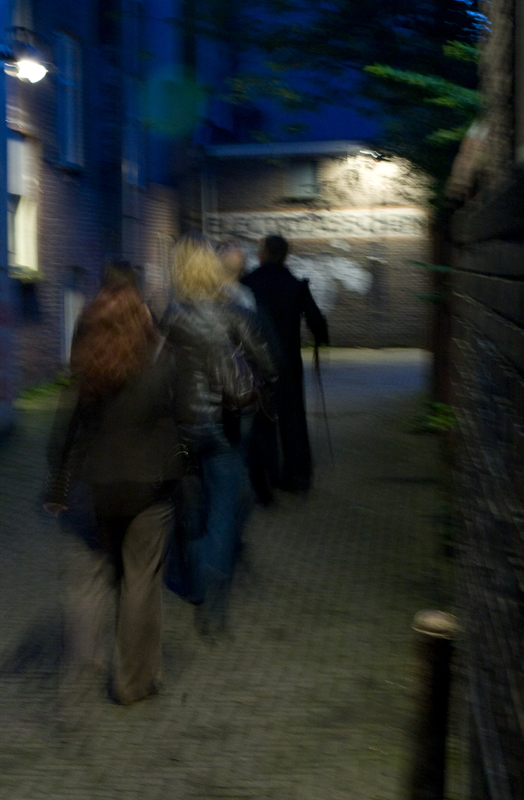 Look for the ghost guide dressed in black and carrying a walking cane. Departure Time: As darkness is required, departure times may vary throughout the year. Check Book Now for the exact times. Number of participants: There are several dates a month open to individual participants. Enquiries welcome from private parties for a minimum of 10 people. Maximum group size is 20 persons. Language: The Ghost Walk can be guided in either English or Dutch. Conditions: Walks take place whatever the weather so come prepared with umbrella, warm clothing and sensible footwear. The walking distance is very manageable for those without disabilities and apart from the occasional bridge there are no hills to speak of in Amsterdam. Still, high heels are not recommended. Age Limit: The stories that are told during the Ghost Walk are usually not suited for children under the age of 10. If you have any doubts whether your child can participate in the Ghost Walk please feel free to call us for information. Cancellation: Tours can be cancelled due to extreme weather conditions, illness of the guide or an insufficient number of participants. If you want to know whether the tour will go on you can call us on the same day at +31 (0)6 416 91 779.